Here’s a collection of serial numbers of Mosrite’s last U.S.A. years. Semie Moseley was working with a small team, making something like one guitar per day – there are series of guitars but also a lot of one-offs, proto-types, custom mades … There are serial numbers that make sense in a line and serial numbers that won’t match in any row … And there are the so called „parts-rites“, Mosrites that are made from parts (signed and unsigned, finished and roughly shaped) that were sold after Semie’s death, for example to Canada (often stamped C93). Please note: All information here is the autor’s belief. The estimated numbers of made exemplars are a rough guess from the saved serial numbers. All information is without engagement, no responsibility is taken for the correctness of this information. 77 1976 65RI white or Pearl White Moseley, bolt neck, no body binding, top jack, trussrod screw at headstock, M-knobs, 1976 headstock logo, eBay October 2016: Mosrite USA The Ventures Model Used w / Hard case, BIN 3418 USD. Not sure about the serial number. 78 1976 65RI black Moseley, bolt neck, no body binding, top jack, trussrod screw at headstock, M-knobs, 3.62kg, 1976 headstock logo, eBay May 2016: Mosrite 76～78'VENTURES MODEL Black Electric Guitar Free Shipping from JAPAN, BIN 3162 USD. 93 1978 65RI Pearl White Moseley, top jack, M-knobs. eBay June 2016: 1978 Vintage Mosrite MARK-I 1965 Electric Guitar 6 String 1970s w/OHSC, BIN 3289 USD. TO RD ·SM3· 1978 (?) 65RI Sunburst Moseley, top jack, neck binding, trussrod screw at body end, M-knobs. Thanks to H.N. for his contribution. X165X 1979 (?) 63RI black/black Moseley, top jack, M-knobs, triple body binding, trossrod adjustment at headstock; eBay December 2016: MOSRITE THE VENTURES Used w/ Hard case, BIN 3193 USD (3009 EUR then) from Japan (free shipping). X165X is the serial number. CC0044 1979 65RI Olympia White (ref.) hardware changed to Moseley hardtail (custom made by Expat Guitars, Tokyo), picture here at the mosriteforum: Mosrites at Expat Guitars!!! AF007 1984 65RI sunburst black AF-Moseley, mint condition, eBay January 2015: MOSERITE VENTURES MODEL,6STRING,AMERICAN,MOSERITE,RIGHT-HANDED starting at 13,000 USD, BIN 16,900 USD. AF1414 1984 65RI California Grape black Moseley, info and pictures here and here at facebook.
? 1985 63RI Sunburst Custom order made by Semie Moseley (according to ad), bound body and headstock, for sale December 2016: USA MosriteモズライトSemie Moseley所有、モズレー自身のギター, price Yen 780.000 (EUR 6357/6748 USD then). „I have been hired by the widow of Semie Mosley’s most significant partner/owner to sell the last 37 Mosrite guitars from the North Carolina Mosrite manufacturing facility. These guitars have been warehoused since they were made in 1986 and 1987. They are all unsold, as-new, not „pre-owned“. They are mostly in dead-mint condition, except for a few that have extremely minor dings or marks from having been stored for 13 years. All guitars are hand made by Semie Mosley and are signed by Semie Mosley on the backs of the pegheads. They all still have the original strings that were put on by Semie at the shop. Since all are hand-made, no two are exactly alike. There are the slightest variations in features such as binding, position dots, peghead shape, etc. They are all made of alder, with maple necks. Each guitar weighs about 8 or 9 pounds. Most of these guitars have a beautiful Sunburst finish, about the best I’ve seen by any maker (including the early Mosrites). Others have rare custom colors, such as white, black, or candy-apple red. Some also have shaded or colored necks. Sixteen of these guitars come with very expensive flight cases that were specially ordered for these uniquely shaped guitars when they were made. I have been told that these cases cost about $250 wholesale when ordered. These cases are covered with the same durable gray carpet-like material that is used on heavy-duty road cases for PA equipment. The cases are heavy, weighing twice as much as the guitars at about 16 to 18 pounds. These guitars will be sold one at a time, exclusively through ebay. „Thank you all for your interest in Mosrite. I am going to try to explain, in this letter, what has been happening with Semie Moseley and Mosrite. First, let me apologize for this being a form letter. I have over one thousand letters which have accumulated during my illness and shutdown. Some day, in the near future, the Semie Moseley and Mosrite Guitar story will be in process. it will read like a fairytale – a drama – a love story; from rags to riches – to rags – to the fight back, from one major tragedy to another, from the very beginning through its evolution to the 1980’s. My wife, Loretta, and I were in an automobile accident which should have taken our lives. A few months in the hospital and more than a year being disabled left us financially depleted and nothing to brag about physically. I went through another major surgery. Our entire factory was destroyed by fire causing a total loss of guitars, inventory, equipment, and much more. It was well over a million dollar loss. The story doesn’t end there, now you have a general idea of where we’ve been and why. It has been only through strength from God that we have survived all of this. I still am determined that we will win. For a while, during the time I was sick, I tried to get help in order to continue building my Mosrite Guitars. But I was not too happy with the quality and the way things were going without my direct attention, so I shut Mosrite down one more time. About eleven months ago, after the last shutdown, I required radical colon surgery. I am now fully recovered and weight two hundred pounds. Our factory is back in Jonas Ridge, North Carolina. Once again, I am going to build Mosrite Guitars in limited quantity. I will re-introduce the Ventures Model. I will also build a new model which will have the option of my newly designed dual coil Mosrite pickups. I will also offer, once again, the Joe Maphis double neck and single neck. I will be directly involved in this production, and will guarantee my guitars for my lifetime. If you have not given up on me, please write and let me know of your interest. I will respond to your request immediately. 87008 1987 65RI white Thanks to MW for his contribution and the pictures. The owner visited Semie Moseley in Jonay Ridge in November 1988 and purchased this guitar and an M1988 prototype, video here: A day with Semie Moseley "Mosrite". 87034 1987/88 63RI Sunburst 1987, signed (under lacquer) in 1988, at www.frettedamericana.com October 2012, price: 5500 usd, thanks to J.P.
V0097 1990 64RI Pearl White picture here at the mosriteforum: Mosrites at Expat Guitars!!! B9006 1990 65RI bass Pearl White Similar to the CJ Ramone bass but with two pole-less pickups. Brass bridge, brass Moseley hardtail. eBay January 2016: Mosrite Ventures Bass Electric Bass Guitar w/ Hard Case, BIN 3995 USD. V911x 1991 65RI black Signed by Semie Moseley 1990, ebay Septemer 2016 ad here: pictures here: 1990 Mosrite Authentic Final Ventures model 65Reissue with sign Black guitar USA, starting at USD 7000, from Japan. Last digit hard to read on the pictures. V9135 1991 65RI Sunburst Signed by Semie Moseley 1991, pictures here: Droolworthy: Mosrite Vibramute Ventures Model. V9159 1991 65RI Pearl White Signed by Semie Moseley 1990/91, auctioned here: 美品フルオリジナルモズライト65セミ・モズレーサイン入り. 63007 1992 (?) 63RI metallic blue December 2016 ad here: USED Mosrite of California USA 63 Reissue The Ventures Model, price: Yen 297.000 (EUR 2421/USD 2564 then). According to the pot dates it is made 1996. Serial number according to ad. 63215 1992 (?) 63RI metallic red I have no real idea when these 63RIs have been made. 63215 has a hang tag that says "Booneville, AR", so it has been made 1992 at the earliest. A sticker on the case says "'92". RANDY 1991 65RI bass Pearl White custom bridge and finger rest; build for Randy Moseley, pix and description here at Reverb.com: Mosrite Ventures Bass. SPECIAL. 1991 Pearl White. Last Guitar built by Semie Moseley. Only One. 1010 S 1992 65RI Snowflake White made for Arlington Guitar Show, picture here at the mosriteforum: Mosrites at Expat Guitars!!! V93103 1993 65RI Sunburst eBay December 2017: Mosrite '65 VENTURES MODEL 1993 REI, BIN US $4,180.34. V931xx 1993 65RI Sunburst eBay June 2016: Mosrite The ventures model made in 1993 manufacturer Unified Inc., BIN US $4,658.46. V94012 1994 65RI Sunburst yahoo July 2017: 【最終ロット】　☆☆　USA・本物・モズライト　Mosrite　V94　SB　サンバースト　☆☆, 360,000円. 0103 1992 (?) 63RI metallic blue eBay April 2018, ad here: MOSRITE 62 '40TH ANNIVERSARY 63RE Used FREE Express Shipping. BIN: 7861 USD (from Japan). 0107 1994/95 63RI Sunburst eBay June 2016, ad here: Free Shipping Used Mosrite '95 The Ventures Model '63 Electric Guitar. BIN: 5331 USD (from Japan). Similar to the Ventures model, but without pickguard. The Mark VIII has the wide carving also on the right (e-string) body side and no carving but a rounding between the horns, the Mark VII has a narrow routing around the whole body’s front. The Mark VIII’s three pickups are mounted parallely sloped or diversified. AF006 (?) Mark VIII/Ventures carving Purpleburst black Moseley diversified pickups – not the typical American-carving, more a Ventures model with three pickups – perhaps a prototype (pickguard), ad and pictures here at reverb.com: Mosrite VIII 1984 Purpleburst. Serial number hard to read on the pictures. Price October 2015: €3,477.44EUR (+ €176.07 shipping). eBay December 2015: 1984 Mosrite VIII Vintage Purpleburst for bin 3995 USD. AF009 Mark VIII very dark California Grape black Moseley diversified pickups – picture here at Facebook: 1984 Mosrite VIII. AF041 Mark VIII Blueburst Moseley parallel pickups (humbuckers without polepieces, no logo covers) –pictures here at facebook: AF041. Thanks to Vincent for all the info! AF042 Mark VIII Pearl White Moseley parallel pickups – eBay February 2016: 1984 Mosrite Handmade & Signed by Semie Moseley Lot 449 starting at 4500 USD (+25%) as part of a live auction event. Sold for 7500 USD. AF2424 Mark VIII Greenburst Moseley diversified pickups, info and pictures here and here at facebook. NC140 Mark VIII black Moseley diversified pickups – story here at tymguitars: 1984 Mosrite VIII. NC143S Mark VIII Storm Grey Moseley diversified pickups – Guitar Auctions March 2014: Mosrite Mk.III electric guitar, made in USA 1984, sold for £1600. Here's a thread with some info and pictures: NGD!!! American Model V3 and an M-88. I guess it’s been made for the Japanese market as a Terauchi Takeshi signature model. Very rare, less asymmetric than a regular Ventures model, with humbuckers and a rose on the headstock. T032 1986 Sunburst Vibramute humbucker in singlecoil (polepiece) cover eBay May 2016: Mosrite Terry Model, BIN 7060 USD. 2511 Vibramute rosewood with binding silverburst 2 black polepieces smooth cover for sale at Reverb January 2019: Mosrite 25th Anniversary Ventures Limited 1988 Silver, price: 12,000 USD/10,911 EUR. 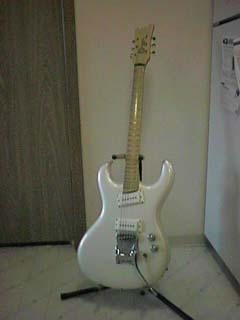 rounded body, no carve, no pickguard, triangeled plate on back, Moseley tremolo or fixed TP; normally: white PUs with polepieces, white backplate, normal roller bridge. Unbound rosewood fretboard on 2 piece maple neck at the early examples; the later examples have a maple fretboard with rosewood board below or on a 3 piece maple neck, large space between zero fret and stringguide. 1988 logo, signed by Semie on headstock front and back. P088 (?) Moseley rosewood goldburst 2 white polepieces Prototype, featured in this YouTube video: A day with Semie Moseley "Mosrite" – Semie mentiones the serial number here: 5:25. Maybe this is the M88 that's pictured in the 1988 Mosrite brochure? 0888 Moseley hardtail rosewood sand metallic 2 white polepieces Early logo; at eBay Dec 2014: Mosrite M88 low s/n 0888, signed by Semie for BIN 3200 USD. 01388 – – Candy Apple Red – For sale from Tennessee in Vintage Guitar magazine back in 1991 (no pictures, so not more info) – thanks to W.S. for telling me. 01488 Moseley maple sparkle purple 2 white polepieces Picture and thread here at mosriteforum: New Guy with M88s. Thanks to W.S. for the info. More pix December 2016 here at facebook. 02088 Moseley hardtail rosewood sand metallic 2 white polepieces Guitar Auctions March 2014: Mosrite M-88 electric guitar, made in USA, 1988; one of five officially exported to the UK; sold for £750. This is the guitar that's pictured in Tony Bacon's "The Ultimate Guitar Book" on page 93 or here at gettyimages. April 2015: for sale in Stockholm: Mosrite M88 Signerad av Semie Moseley for 26.000SEK (2800 EUR then). 02688 Moseley maple Cranberry 2 white polepieces Thanks to J.P.
02788 Moseley rosewood Pearl White 2 white polepieces eBay May 2015 Mosrite M88 s/n 02788 "signed by semie", BIN 2400 USD. In November 2015 it can be found on Gruhn Guitars: Mosrite M88, 1988 for 2500 USD. 03288 Moseley hardtail rosewood black 2 white polepieces at eBay Dec 2014: Mosrite M88 Hard Tail "signed by Semie Moseley" for BIN 3400 USD. 03488 Moseley maple gray metallic 2 white polepieces Headstock back has a ladybug sticker and "To JB" in Semie's handwriting. Reverb December 2017 Mosrite M88 1988 Gray Metallic, price 3400 USD (€2.957,05 then). Hope I've read the s/n correctly. 03888 Moseley hardtail maple Diamond Yellow/Butterscotch 2 white polepieces Guitar Auctions March 2014: Mosrite M-88 electric guitar, made in USA, 1988; one of five officially exported to the UK, sold for £920. Here's a thread with some info and pictures: NGD!!! American Model V3 and an M-88. 04088 Moseley rosewood Diamond Ebony 2 white polepieces Thanks to J.P.
04188 – – yellow – For sale from Tennessee in Vintage Guitar magazine back in 1991 (no pictures, so not more info) – thanks to W.S. for telling me. 04388 Moseley maple sparkle blue 2 white polepieces Picture and thread here at mosriteforum: New Guy with M88s. Here's a video at youtube: Review Mosrite M88 guitar thru Fender amp Semie Moseley. Thanks to W.S. for the info. 05088 Moseley maple Pearl White 2 white polepieces Small picture here at the Mosrite Owner's List: Pearl white with white pickups, Flame maple fretboard. 0? ?88 Moseley maple sand 2 white polepieces Great video here at youtube: Bugera 5 watt amp test with 1988 Mosrite Guitar – could not find out the s/n. LISA88 Semie Moseley Vibramute rosewood with binding pink with painting or sticker 2 white polepieces Butterflies painting/sticker; some info here: Tyler's Mum's Guitar! V0888 Moseley hardtail rosewood with binding Diamond Red 2 white polepieces Not sure about s/n - hard to read on the pictures. Neck, headstock & hardtail painted. Reverb November 2016: Mosrite Model 88 1988 Sparkle Red, price 2500 USD plus shipping. V040 Moseley rosewood with binding Diamond Red 2 white polepieces Thanks to J.P.
N006 Vibramute rosewood with binding Sunburst 2 white polepieces 1989, no Nokie logo, regular Ventures body. For sale here: 1989 Mosrite MK-1 Electric Guitar Sunburst - Used, price: USD 2499. Original Kluson style tuners changed to Grover Rotomatics. N014 Semie Moseley Vibramute maple Sunburst 2 white polepieces 1989; 1988 and Nokie logo; Reverb November 2016: Mosrite The Nokie 1988, 1400 USD. N0027 Semie Moseley Vibramute rosewood with binding Candy Apple Red 2 black polepieces 1990 (? ); Reverb May 2014: 1990/91 Mosrite Nokie Model Candy Apple Red USA Made EX/NM w/HSC, 2195 USD. N91-38 Semie Moseley Vibramute maple on rosewood veneer sparkle blue 2 black no polepieces 1991, 1988 + The Nokie headstock logo, Semie Moseley neckplate, signed Semie Moseley at the headstock's back and by Nokie Edward on the body. Auctioned at jauce.com August 2018: 超希少 極上美品MosriteUSA Nokie model 1988ノーキーモデル オリジナル 限定50本モズライトVENTURESベンチャーズ 自筆サイン入り△537B6-3. N91-41 – maple on rosewood veneer – – neck only sold by C.M. from Canada in 2007 – thanks to G.G. for that info! SMP01 Vibramute rosewood with binding Sunburst 2 black polepieces Semie Moseley prototype, 1990 (?) Thanks to J.P.
SM004 Semie Moseley Vibramute rosewood with binding blue with airbrush 2 painted polepieces 1992, sidejack, Nokie-model body shape. For sale March 2017 here: Mosrite Ventures Moon, price 1950 USD. AF001 Moseley or black Moseley (changed) rosewood with maple Burnt Orange 3 black polepieces 1984, Double Axe prototype, 24 frets, pictures here at Expatguitar's Photobucket site. early ones without ramone’s logo. The first may be the white custom made guitar that was made by Semie for Johnny. Some without logo seem to be 1-pickup-versions of other Mosrites. The ones with the „The Ramone’s model“-logo may’ve been made by the family/Loretta Moseley after Semie’s passed away.
? 1988-M rosewood with binding black 1 black bridge no polepieces Johnny Ramone's (? ), white PG, natural headstock, 1988-"M", bound neck, Kluson tuners, fixed Moseley. Given away in 1990 to an Italian fan? Or did the Ramones only deliver it to Italy? R9003 regular Mosrite, no addition except for an (R) rosewood with binding Pearl White 1 black bridge straight 1990, black PG, natural headstock, bound neck, Kluson tuners, fixed Moseley, Ventures body, Semie Moseley signed headstock back. Belonged to Johnny Ramone. Auction October 2016 here: Johnny Ramone Mosrite Johnny Ramone Model Electric Guitar, 1990, sold for $28,499. For sale again March 2017 here: Johnny Ramone's 1990 Mosrite Ventures Model. R9004 1988-M, "mosrite" without any addition except for an (R) rosewood with binding (untypical alignment frets-binding) white 1 black bridge straight black PG, natural headstock, bound neck, Kluson tuners, fixed Moseley, Ventures body. For sale on G-Base.com/ebay for 5900,- USD in September 2011. Auction ended because of discussion if it's original or not. Comparision between R9003 and R9004 seems to show that R9004 from the auction/ad is actual fake ;) Even the serial number's punch stamps have a differnt font.
? – – Pearl White 1 black bridge straight black PG, natural headstock, classic "M", wood-tailpiece, Ventures body. RB001 1988-M, "mosrite" without any addition rosewood with binding white 1 black no-polepieces neck 1990 Ramones bass custom made for CJ Ramone, Semie Moseley signed headstock back, Moseley hardtail, black Grover tuner, last pictures seen with CJ Ramone February 2001 (date of sale?). Auction October 2016 at www.skinnerinc.com: C.J. Ramone Mosrite The Ramones Model Electric Bass Guitar, 1990 (link's gone). 91005 regular Mosrite rosewood Translucent Blonde 1PU black straight bridge ordered 1990, in fact a Victory III with only one PU, natural headstock, classic "M"-logo, Kluson-tuners; buyer (forum member mosriteguitars) wanted rosewood tailpiece for lower weight, story here at mosriteforum: Ramones Mosrite. RO2001 Ramone's rosewood with binding Pearl White 2PU 1993?, according to Tim/Tymguitars it's hollow. My guess: It's made after Semie's death, maybe from parts (employee?, Loretta Moseley?). Some info here at mosriteforum: Mosrite - The Ramone's model and here at guitarnerd: Mosrite – The Ramone’s model. RO2003 Ramone's rosewood with binding metallic blue 2PU 1993?, according to Tim/Tymguitars it's hollow. My guess: It's made after Semie's death, maybe from parts (employee?, Loretta Moseley?). Some info here at mosriteforum: Mosrite - The Ramone's model and here at guitarnerd: Mosrite – The Ramone’s model. G9012 I gold 2 white no polepieces Ventures Grover Rotomatic tuners, Thanks to J.P.
G1006 I gold 3 white no polepieces Gospel Victory I Kluson style tuners, Thanks to J.P.
G2003 II gold 2 white no polepieces Ventures Thanks to J.P.
G3003 III translucent blond 2PUs, white, no polepieces slab w/b/w/b/w PG, Thanks to J.P.
0004 NA30 Semie Moseley Vibramute rosewood with binding Sparkle Blueburst Sparkle Blue Thanks to the owner for the info. 0007 NA30 Semie Moseley Vibramute rosewood with binding Sparkle Blueburst Sparkle Blue Signed by Nokie Edwards; ad July 2016 here: mosrite The Nokie 30th FRPツァーケース付き　USED品・送料込み, price 1,050,000円 (8932 EUR then). The ad says it's made Juli 31, 1992. 0044 NA30 Semie Moseley Vibramute rosewood with binding Sparkle Blueburst Sparkle Blue Signed by Nokie Edwards and others – eBay September 2016: Mosrite USA The Nokie 30th Anniversary, price 8401 USD. 0051 NA30 Semie Moseley Vibramute rosewood with binding Sparkle Blueburst Sparkle Blue Thanks to the owner for the info. 40001 Vibramute rosewood with binding Sunburst black smooth polepieces Golden neckplate "Semie Moseley 40th Anniversary 1952 – 1992"
014x Vibramute rosewood with binding Sunburst black smooth polepieces s/n 0143 or 0145 (hard to read on the small pictures), eBay October 2016: Mosrite 1992 year made USA The Ventures Model 40th Anniversary Electric, BIN 3975 USD. Weight: 3.93kg. 0xxx Vibramute rosewood with binding Strawberry Red black smooth polepieces sorry, I don't know the serial number – for sale in Japan November 2016: Mosrite '92.MOSRITE THE VENTURES MODEL 40TH ANNIVERSARY U.S.A., price: ￥432,000 (3697 EUR/3989 USD then). 0147 Vibramute rosewood with binding Strawberry Red black smooth polepieces Serial number hard to read (on the small pictures), eBay January 2016: Mosrite THE VENTURES MODEL 40th Anniversary Strawberry Red, BIN 4588 USD. Weight: 3.75kg. 0149 Vibramute rosewood with binding Sunburst black smooth polepieces eBay August 2016: 1992 Mosrite THE VENTURES MODEL 40TH ANNIVERSARY Limited Electric Guitar w/HC, BIN 5215 USD. Weight: 3.95kg. 0157 Vibramute rosewood with binding Strawberry Red black smooth polepieces yahoo April 2018: 【返品OK】[良品] mosrite MARK-1 1963 Reissue Red ベンチャーズ [ME658], weight: 3.6kg. Allegedly 50 in Marine Blue and 10 in Pearl White have been built in the USA in 1993. Unique Vibramute tremolo and headstock logo.
? 1981 Custom doubleneck for Barbara Mandrell silver blue glitter changed to Bartolini pickups Pix and story here: NMM 6191. Electric double-neck guitar by Semie Moseley, Carson City, Nevada, 1981. JM41 1987 Joe Maphis doubleneck Sunburst custom, black with polepieces Moseley, “Made with Love By Semie Moseley, 1987” and “For you Joe, Love you, Semie”. At eBay April 2015: 1987 Mosrite Joe Maphis Double Neck Six String Octave Guitar Sunburst Signed, BIN 5995 USD.
? 1988 Mister President Sunburst 3PUs, white, with polepieces made for George Bush Sr. (who never got it). Pix and info in this April 2015 eBay add: MOSRITE MR PRESIDENT GUITAR; starting at USD 30.000, BIN: USD 39.000. NMM 6190. Electric lap steel guitar by Semie Moseley, Jonas Ridge, North Carolina, 1984. 1988 CHRIS custom translucent red 1 white neck with polepieces 1 white neck with polepieces 1988 headstock logo, made for Christopher Todd Clark, signed on neck. Some pictures here at the owner's flickr album Custom Mosrite Hand Made By Semi Moseley Himself. 世界に1本 SEMI MOSELEY入魂　モズライト MOSRITE MARK.MOSELEY model 直筆セミーモズレー遺言?付,BIN: 5,000,000円 (38,875EUR/44,260USD then). 1990 V0170 Vibramute rosewood with binding metallic red 2 black polepieces "Custom Tone Chamber Ventures"
1990 no s/n (?) Moseley hardtail rosewood, no binding metallic red 2 black humbuckers without polepieces Mosrite of Canada logo at headstock, prototype, Reverb January 2019: Mosrite of Canada Mark I Prototype 1990 cranberry red, pots 1379001, Moseley hardtail, Grover tuners, shape/pickguard similar to V88, price: $3.799. 1991 MOT-1 Semie Moseley Vibramute rosewood with binding and M C inlay metallic blue/purple, flame pinestriping 2 black humbuckers with polepieces Made for Mötley Crüe's Mick Mars. Dana Moseley: "My Dad delivered it personally. In the truss rod cavity there should be a strip of cloth that Dad had his church pray over because he was concerned about giving this guitar to, (what he thought was), a Satanic group. My father was a very religious man. The story goes that 2 wks later was when MC broke up.". For sale March 2017 here: Mosrite MC, price: 2900 USD. 1992 (?) ? Moseley rosewood with binding red 2 black polepieces Gary Paxton's cartoonish Mosrite, some pix here at the mosriteforum.